One of the most common questions we get about fatherhood programming is, "Do you have anything to help teen dads?" Our answer is yes! Yes, we do. It's called 24/7 Dad® and in this post, you will see how one coordinator is using the curriculum to help teen dads in his area. 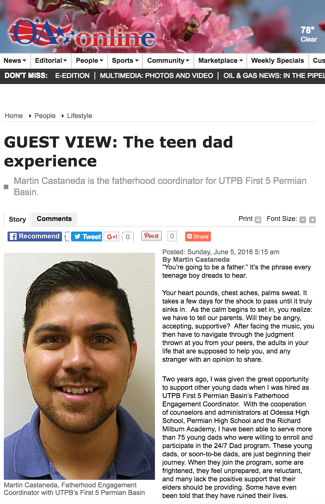 The following post by Martin Castaneda, fatherhood coordinator for UTPB First 5 Permian Basin orginally appeared here. “You’re going to be a father.” It’s the phrase every teenage boy dreads to hear. Your heart pounds, chest aches, palms sweat. It takes a few days for the shock to pass until it truly sinks in. As the calm begins to set in, you realize: we have to tell our parents. Will they be angry, accepting, supportive? After facing the music, you then have to navigate through the judgment thrown at you from your peers, the adults in your life that are supposed to help you, and any stranger with an opinion to share. Two years ago, I was given the great opportunity to support other young dads when I was hired as UTPB First 5 Permian Basin’s Fatherhood Engagement Coordinator. With the cooperation of counselors and administrators at Odessa High School, Permian High School and the Richard Milburn Academy, I have been able to serve more than 75 young dads who were willing to enroll and participate in the 24/7 Dad® program. in the 24/7 Dad® program." These young dads, or soon-to-be dads, are just beginning their journey. When they join the program, some are frightened, they feel unprepared, are reluctant, and many lack the positive support that their elders should be providing. Some have even been told that they have ruined their lives. There aren’t many people in a teen dad’s corner letting them know that everything is going to be alright while guiding them through the early stages of fatherhood. That is what UTPB First 5 Permian Basin set out to accomplish with its implementation of 24/7 Dad®. We wanted to establish a feeling of support, reassuring the young men that they can and will be successful in fatherhood and in life if they want it. We begin our first session with a simple question: “What kind of man do you want to be?” Then it all takes off from there. Once we’ve gotten through the initial barrier of awkwardness, something comes to life in the teens. Perhaps something we cover early on lights a match in their mind, and from that point, everyone is eager to share and learn. 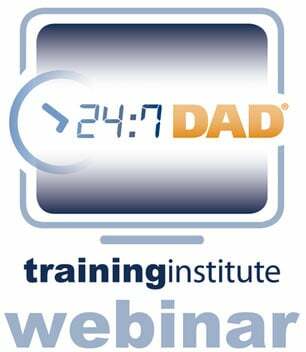 The curriculum, 24/7 Dad®, was developed by the National Fatherhood Initiative. 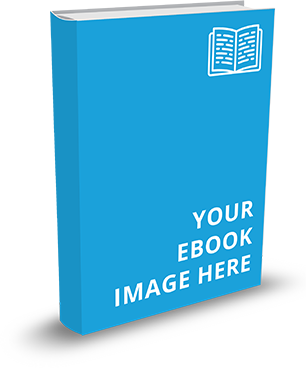 It covers a wide range of topics regarding parenting and being a responsible man. In addition to that, I try and teach them everything I know about fatherhood and being a good man, but I usually end up learning so much more from these young fathers. 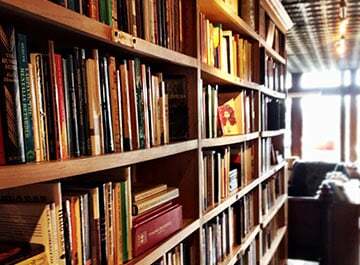 During the past two school years I have never had a day where I leave a session feeling that it was dull and routine. Every day is fresh and full of surprises. What I typically find is that each and every teen wants to be a great father. They want to go further than their fathers before them, and hope their children surpass them and go even further. All they need is the support and someone to believe that they can still achieve their dreams and be a great father while doing so. We need to teach our young fathers that being a dad is an amazing experience, and that they can and will be an amazing parent. "...they can and will be an amazing parent." The growth I’ve seen in these young men is remarkable. They progress from being unsure about their future and ability to be a good parent to the point where they are finishing school, improving their grades, and developing life plans. They are setting high, yet very attainable goals for themselves and their children. I’m truly honored to have had this small role in the lives of my students and am proud of each and every one of them. I wish them all the luck (though they won’t need it) in growing to be a parent we can all be proud of. "...and they will grow to be great men." So I ask those of you who haven’t experienced teen pregnancy, to look past your judgments. While I’ll agree that teen pregnancy and parenthood is not the ideal situation, these are some of the best fathers I have ever known, and they will grow to be great men. All they need is our support. Originally posted by Martin Castaneda, the fatherhood coordinator for UTPB First 5 Permian Basin here. Are you a dad looking for help or interested in volunteering like Martin? Please visit our Fatherhood Program Locator™ to find programs and resources in your community.